Memory is an elusive thing, often distorted by time and the inclusion of unintentionally specious fictions in the retelling of stories handed down from one generation to another. Occasionally a sliver of truth finds its way into our awareness and triggers a desire to expand our knowledge of it. When there is tangible evidence it’s a relatively uncomplicated process. When there is nothing to perceive imagination – and some research – is required. If there is one pair of structures that provide an anchor for the Midtown section of the city, it’s the Broad Street Market. Despite the fact that there is no Broad Street in the city, it goes by that name nonetheless. 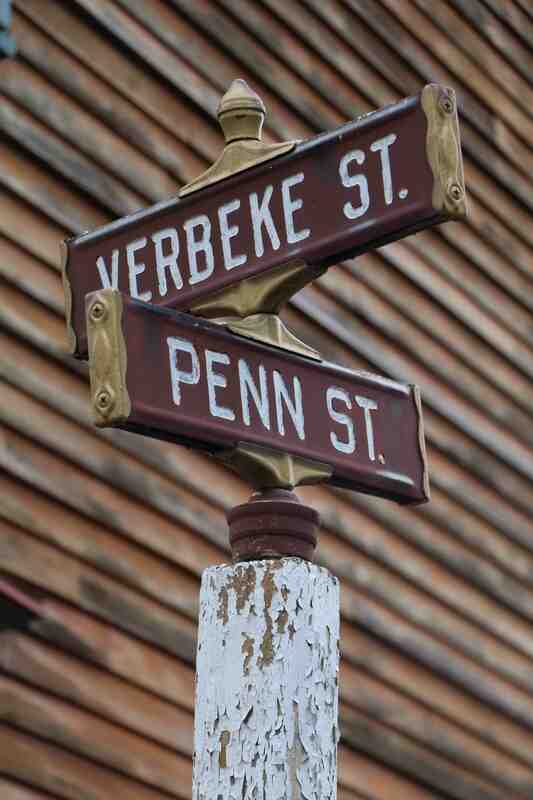 In the nineteenth century there was an effort to make the name stick, but Verbeke Street prevailed. Named for William K. Verbeke, the street has two distinct characteristics. There is the section running from North 6th Street to 3rd Street, and, like a number of similar city thoroughfares, it terminates and then resumes on Cameron Street. With time’s passage many things, especially buildings, are constructed, used, become obsolete, aren’t attractive anymore or, are simply in the way of that contentious word, progress. It’s why protestors carry picket signs and chain themselves to historic structures slated for demolition, rarely to any avail, unable to arouse the public from its apathy. In the case of the four blocks along Verbeke that parallel the Broad Street Market, the passage of time has left little to see, save one gem, The Millworks. Dating to 1929, the Stokes Millworks building produced architectural grade woodwork and was a thriving entity in the midtown area, as well as providing material for the many new buildings constructed in the city from its inception to its closure in the 1990s. Repurposed, fortunately, as a multi-use building with a rooftop biergarten, on-site microbrewery, gallery and gift shop, it also has 25 artist studios that are rented to area artists where they can create and sell their work. The Millworks complex occupies approximately 24,000 square feet on multiple levels and takes up an entire city block. But what about the other three blocks along Verbeke? If you stand next to the black steel smoker that is a fixture on the sidewalk in front of the Millworks and look toward 3rd street, you see, well, nothing. Or, do you? Seeing is specific to the individual and often determined by the way that they have been acclimatized to the world that surrounds them. To someone with little interest in the past, those three empty blocks are simply that, three empty blocks. To someone with an appreciation of history, they may evoke an awareness of things past in those spaces. To someone with imagination, those empty spaces are filled with buildings and people living and working in an entirely different milieu. Well within the memory of many, Mercurio Brothers operated a wholesale fruit and vegetable business at 320 Verbeke Street. With its beginnings in 1939, it was a thriving business typical of many along the street. With the passing of Sam Mercurio in 2015 an era, and a tangible bit of Harrisburg history disappeared. Further down the street another place well within the memory of many city residents was a truly outstanding restaurant and mecca for many seeking a good meal at a fair price. Alsedek’s Restaurant at 316 Verbeke was first opened by Mr. Alsedek, a Syrian émigré, as the White Palace Restaurant. With the Broad Street Market across the street and Mercurio Brothers just up the street the Alsedek family could assure great meals for their customers. It was a family affair, with Donald Alsedek working together with his brother Albert and sister Doris under the direction of their parents. It was an American success story that allowed a business to support four families and provide employment to others in the neighborhood. Turning again to those empty spaces, now parking lots and, strangely, a grassy plot that represents, as well, a former business. But let’s get back to imagining, now moving backward in time to the late 19th Century. At the intersection of James and Verbeke stood a hotel, the Dapp Hotel, owned and operated by Gottelieb Dapp, who emigrated to America from Germany on March 13, 1880, landing in New York on March 31, 1880 and arriving in Harrisburg 0n April 7, 1880. There are no photographs extant of the hotel, presumably (remember, we’re looking at an empty lot and using our imagination) two or three stories, probably made of brick. It was also likely the family residence. It remained the Dapp Hotel until 1907 when Gottlieb’s son, John F. Dapp, a banker and real estate broker, facilitated its sale. Again, using our imagination and looking backward to a time less frenetic, we go back up the street to the Millworks building and realize that John F. Dapp had the sagacity to open a livery stable at 417 Verbeke to accommodate the horses that the farmers used to haul their wagons to the Broad Street Market. If you need a modern comparison, imagine owning a parking lot or garage in the city. Mr. Dapp sold the livery at approximately the same time he brokered the sale of the family hotel. And, to add to the local store of Verbeke Street knowledge, Alsedek’s restaurant building was originally a harness shop. Presumably the farmers could get repairs made while they were selling their commodities across the street at the market. The interactive map that has been developed as a collaboration between Messiah College, Harrisburg University of Science and Technology and the Historical Society of Dauphin County. The participants in this invaluable effort scanned the entire 1901 Harrisburg Title Company Atlas. Data includes information from the federal census that allows the viewer to determine the location of a specific property and numerous personal indices relative to families or individuals living within a specific property in 1901. Log on and take a look at 314 Verbeke. You’ll never look at those vacant spaces on Verbeke west of the Millworks in quite the same way again. Next post: Simply the Best Gala is Coming!